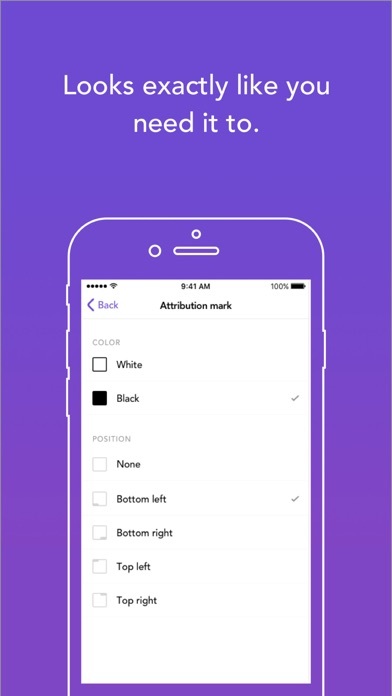 Repost makes it easy to share photos and videos on your Instagram profile. - Repost photos, videos and multiple media posts on Instagram - The caption is automatically copied to clipboard (up to you, no pressure!) - Custom colors and positions for attribution overlay Repost an Instagram post in 3 simple steps: 1) Open Instagram and find the media you want to repost 2) Tap on the option button (•••) and select Copy Share URL 3) Open Repost and wait for the post to show up automatically Want to share photos across multiple business profiles? 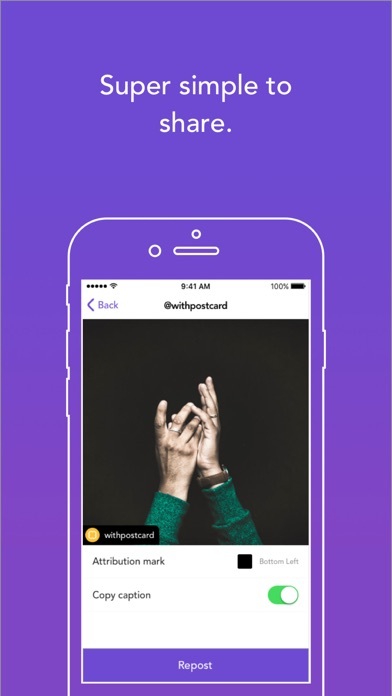 Want to regram your friends' photos? This is the right tool for the job. Disclaimer: This app is not sponsored, endorsed by, or affiliated with Instagram, Inc. Anyone who uses Instagram needs this app. I am an older woman who is technologically challenged! This app is EASY to understand. And in a few easy steps, my videos are loaded up! Thank you! 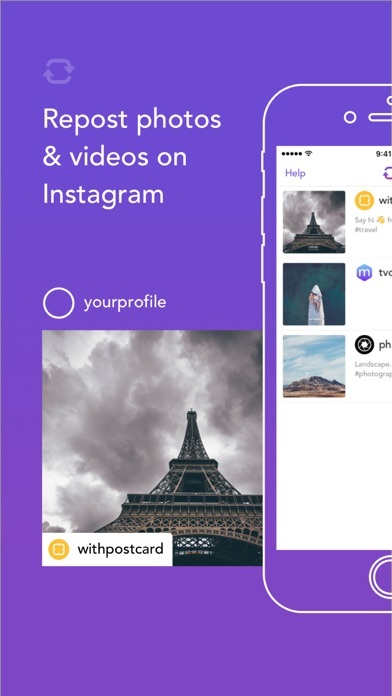 I’ve been using this app the past couple weeks, I love the customizable options and no ads, props for no paid subscription to repost and remove watermarks. However the past few days whenever I try to copy a link and repost a post, the app crashes. I’m on iPhone X most recent iOS, the issue seems recent. In the past it’s been flawless, would love to see this issue fixed. So I been reposting for Instagram for some time and I find this app it's be working good but after some months it stop working so I uninstalled it and reinstalled it and still not working can u help?? Best app for reposting and saving videos to your gallery. Every time I try to repost or simple save a video, it kicks me out. Love this app! Easy to use! Something’s really wrong! It’s so annoying when I’m trying to repost to my instafeed and it blacks out and kicks me right out of Instagram. I literally go back to the home page of my iPhone. I dig this app SO MUCH!!! However this has to be resolved and it doesn’t happen on all the reposts but enough that it’s gotten on my last nerve. Right now I have 3 items in the history bin that can’t be reposted. Please fix this and yes I checked on updates and one isn’t needed at this time. The developer of this app has done an awesome job, the app is great and has been a real pleasure for me. Thank you! This is a must-have app if you are a marketer. Super-easy to repost and attribute at the same time. Essential app! Never got to use it. Crashed every time I tried. Great app but I haven’t been able to repost since the update. It closes down every time I try. This wasn’t my first repost app, but this definitely is the best so far. Thank you. I just started using this app, and it is so easy! Great for all things reposting. Thank you for your app- it helps us all stay informed! It’s a good app, and is pretty easy to use. Although, I’m sure if it was an update or a completely new app, the old Repost app in my opinion just had a better layout. But really still a good app. I feel like on the old app I could repost anything. I’m sure it has to do with Instagram too, but it’s like all the post I want to repost I can’t, because it says they’re private. I guess that’s not Reposts fault but if I can’t repost something then it kind of is pointless to have. Easy to use and flexible in crediting and captions. Thank you! It’s a app good , & I just like it😂🤷🏽‍♀️.